Happy Hump Day Lovelies! And hurray for the second day of Canadian businesses in beauty! oH Canada! 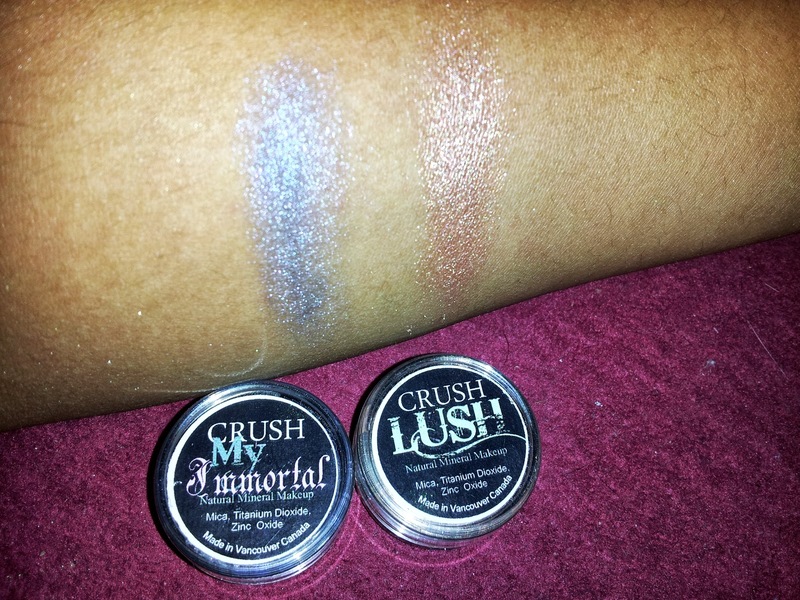 Today I would like you to check out Crush Cosmetics. Based out of Vancouver, BC, Crush Cosmetics is run by Kym and Kristina. The etsy shop is absolutely eye candy to behold: lots of vegan-friendly makeup. Not just limited to eyeshadows, they also have a line of pressed mineral blushes, lip glosses and lip balms, as well as bath teas and solid perfumes. So a lot of variety is packed into this cute little etsy store! You could create a whole look from Crush Cosmetics products alone. Sounds like the makings of a future blog post ;) I was given the chance to try two lovely eye shadows and have swatched them for you below. On the right is Lush: a kind of pinkish copper with a bit of a taupe undertone. I like my neutrals and this is definitely a colour you could rock out both day and night. At least I do ;) It also serves as a great backdrop for your lids. Please check out Crush Cosmetics' etsy store and their blog as well. Thank you for letting me try your wonderful eye colours! I was sent these products for the purposes of review. The thoughts and opinions expressed are mine own.